The second item to appear in the June, 1944, issue of THE READER AND COLLECTOR is this short essay by H. P. Lovecraft. 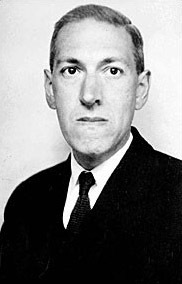 Shortly after discovering Hodgson (through a loan of WHH books to HPL by Koenig), Lovecraft had meant to incorporate Hodgson into his groundbreaking essay, “Supernatural Horror in Literature”, but the fanzine which had been serializing it ceased publication before that chapter could be printed. Lovecraft would later incorporate this essay into “Supernatural Horror in Literature” and it remains in all of the later reprintings of his overview of weird fiction. Despite this, Lovecraft’s original essay is worthy of reading and stands as one of the earliest efforts at Hodgsonian criticism. Master of the Macabre. Author of fifty or more tales of fantasy and terror chiefly in Weird Tales magazine. Represented in the anthologies “Creeps by Night”, “Beware After Dark”, “Not at Night”. Author of brilliant essay on “Supernatural Horror in Literature”. Complete works may be found in the two volumes “Beyond the Wall of Sleep” and “The Outsider” published by Arkham House. Mr. H. C. Koenig has conferred a great service on American “fandom” by calling attention to the remarkable work of an author relatively unknown in this country, yet actually forming one of the few who have captured the elusive inmost essence of the weird. Among connoisseurs of fantasy fiction William Hope Hodgson deserves a high and permanent rank; for, triumphant over a sadly uneven stylistic quality, he now and then equals the best masters in this vague suggestions of lurking worlds and beings behind the ordinary surface of life. Despite a tendency towards conventionally sentimental conceptions of the universe and of man’s relation to it and to his fellows, Mr. Hodgson is perhaps second only to Algernon Blackwood in his serious treatment of unreality. Few can equal him in adumbrating the nearness of nameless forces and monstrous besieging entities through casual hints and significant details, or in conveying feelings of the spectral and the abnormal in connection with regions or buildings. In The Boats of the Glen Carrig (1907) we are shown a variety of malign marvels and accursed unknown lands as encountered by the survivors of a sunken ship. The brooding menace in the earlier parts of the book is impossible to surpass, though a let down in the direction of ordinary romance and adventure occurs toward the end. An inaccurate and pseudo-romantic attempt to reproduce eighteenth-century prose detracts from the general effect, but the really profound nautical erudition everywhere displayed is a compensating factor. The House on the Borderland (1908)—perhaps the greatest of all Mr. Hodgson’s works—tells of a lonely and evilly regarded house in Ireland which forms a focus for hideous other-world forces and sustains a siege by blasphemous hybrid anomalies from a hidden abyss below. The wanderings of the narrator’s spirit through limitless light-years of cosmic space and kalpas of eternity, and its witnessing of the solar system’s final destruction, constitute the author’s power to suggest vague, ambushed horrors in natural scenery. But for a few touches of commonplace sentimentality this book would be a classic of the first water. The Ghost Pirates (1909)—regarded by Mr. Hodgson as rounding out a trilogy with the two previously mentioned works, is a powerful account of a doomed and haunted ship on its last voyage, and of the terrible sea-devils (of quasi-human aspect, and perhaps the spirits of bygone buccaneers) that besiege it and finally drag it down to an unknown fate. With its command of maritime knowledge, and its clever selection of hints and incidents suggestive of latent horrors in nature, this book at time reaches enviable peaks of power. The Night Land (1912)—is a long-extended (538pp) tale of the earth’s infinitely remote future—billions of billions of years ahead, after the death of the sun. It is told in a rather clumsy fashion, as the dreams of a man in the seventeenth century, whose mind merges with its own future incarnation; and is seriously marred by painful verboseness, repetitiousness, artificial and nauseously sticky romantic sentimentality, and an attempt at archaic language even more grotesque and absurd than that in Glen Carrig. Allowing for all its faults, it is yet one of the most potent pieces of macabre imagination every written, and is said to have been the author’s favorite among his works. The picture of a night-black, dead planet, with the remains of the human race concentrated in a stupendously vase metal pyramid and besieged by monstrous, hybrid, and altogether unknown forces of the darkness, is something that no reader can ever forget. Shapes and entities of an altogether non-human and inconceivable sort—the prowlers of the black, man-forsaken, and unexplored world outside the pyramid—are suggested and partly described with ineffable potency; whilst the night-bound landscape with its chasms and slopes and the dying volcanism takes on an almost sentient terror beneath the author’s touch. Midway in the book the central figure ventures outside the pyramid on a quest through death-haunted realms untrod by man for millions of years—and in his slow, minutely described, day-by-day progress over unthinkable leagues of immemorial blackness there is a sense of cosmic alienage, breathless mystery, and terrified expectancy unrivalled in the whole range of literature. The last quarter of the book drags woefully, but fails to spoil the tremendous power of the whole. Mr. Hodgson’s later volume, Carnacki, the Ghost-Finder, consists of several longish short stories published many years before in magazines, in quality it falls conspicuously below the level of the other books. We here find a more or less conventional stock figure of the “infallible detective” type—the progeny of M. Dupin and Sherlock Holmes, and close kin of Algernon Blackwood’s John Silence—moving through scenes and events badly marred by an atmosphere of professional “occultism”. A few of the episodes, however, are of undeniable power; and afford glimpses of the peculiar genius characteristic of the author. Something of Mr. Hodgson’s career—which included the sea, and which closed heroically with death on the battlefield in 1918—has been told in the article by Mr. Koenig. Here, certainly, is an author not to be ignored; and one may be confident that the years will win him a position close to the rank of fantasists. Two of Lovecraft’s stories, “The Rats in the Walls” and ”The Dunwich Horror” appear in one of the best omnibus books published, “Great Tales of Terror and the Supernatual” edited by Herbert A. Wise and Phyllis Fraser and recently issued by Random House. Hello, Query really if WHH was to be included in HPL’s Supernatural Horror in Literature essay which date would it have been? The original 1927 or the revised 1934. Good question. Because we know that HPL didn’t read WHH until 1934, it would have been in the revised edition. On What Day Did Hodgson Die? New HOUSE ON THE BORDERLAND edition! Happy 140th Birthday, William Hope Hodgson! "The Voice in the Night"
Carnacki #3: "The Whistling Room"
The mis-adventures of Queen Cosplay DIVA Cara Nicole! !